Welcome to the Montauk Cutoff, Long Island City. 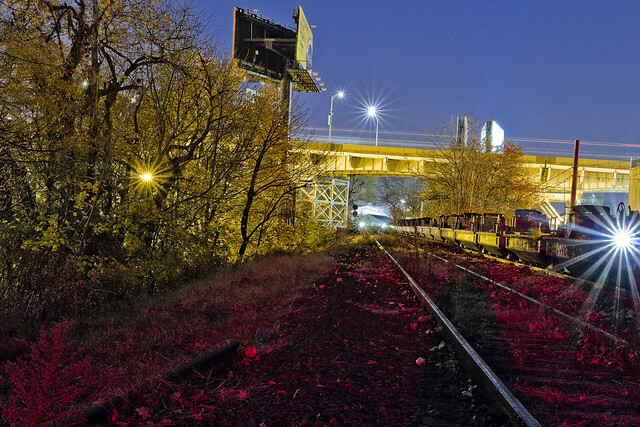 Recently, one found himself hitting the tracks just before sunrise. I was there with sanction, accompanied by an MTA employee and entirely “legal.” It should be mentioned, again, that illegal trespass is against a humble narrator’s code, and like a vampire – I need to be invited in to do my thing. You also really, really, don’t want to get caught trespassing up here by the railroad cops, by the way. 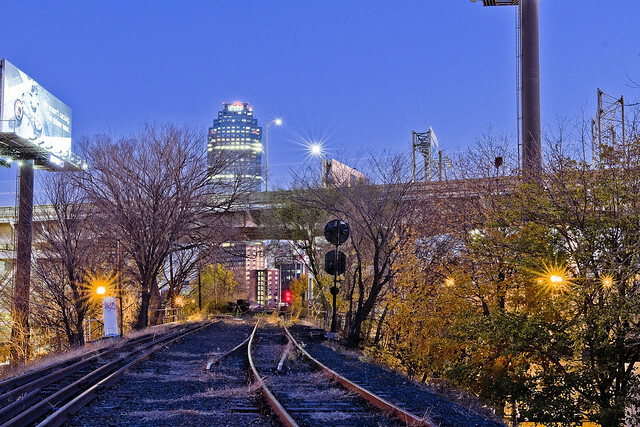 You also really, really, don’t want to meet the sort of person who camps out along railroad tracks in LIC when you’re all alone in the wee hours. 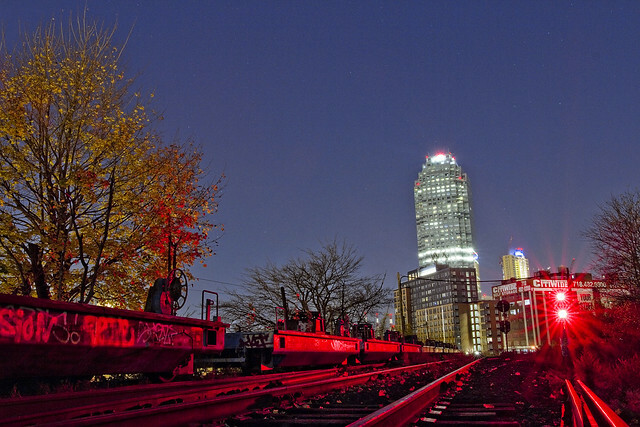 The Montauk Cutoff in Long Island City was designed to connect the North Shore line with the Montauk Line. 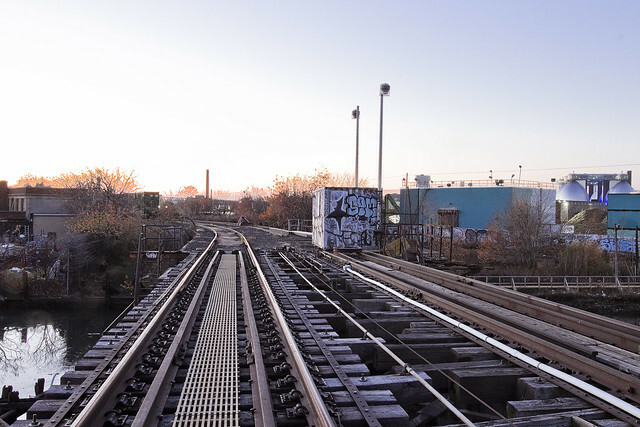 The Montauk Line uses the tracks which follow the shoreline of Newtown Creek through Queens, eventually intersecting with the Bushwick Branch and both head for the rail yard at Fresh Pond. 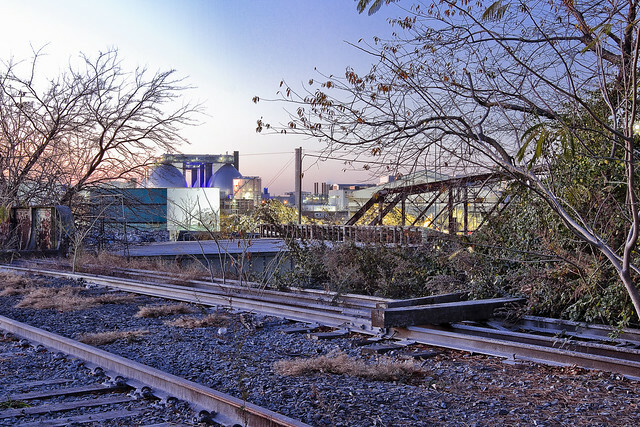 The elevated trackway of the Montauk Cutoff crosses Skillman, 49th, 50th, 51st, and Borden Avenues, whereupon it meets a rail bridge called Cabin M which spans Newtown Creek’s tributary Dutch Kills. The North Shore line used what are approximately the modern LIRR passenger tracks, give or take a few yards, which transverse the Sunnyside Yards and head through Woodside on their way east. The Montauk Cutoff was built for freight, as were the North Shore and Montauk Lines. Passenger service was always a loser for the LIRR. Modern day freight on the LIRR is handled by the New York & Atlantic company. The first discussion, which I’ve been able to find at least, about building LIC’s Montauk Cutoff was in 1906 – as part of a series of railroad projects either proposed or already under construction at the start of the 20th century by the Pennsylvania Railroad Company – projects which included Penn Station and Sunnyside Yard. Other documents I’ve examined state that the LIRR was paying taxes to New York State as early as 1912 on the Montauk Cutoff, which suggests that it came into service around the same time that the Sunnyside Yards came online. The surrounding Degnon Terminal wasn’t far behind the rail complex, either, with the Loose Wiles factory and other mega factories opening in the 1920’s. As is always mentioned, old Mitch ain’t no authority on the whole railroad thing. If there’s something wrong in my little summary, please let me know in the comments and corrections or an errata will be incorporated. 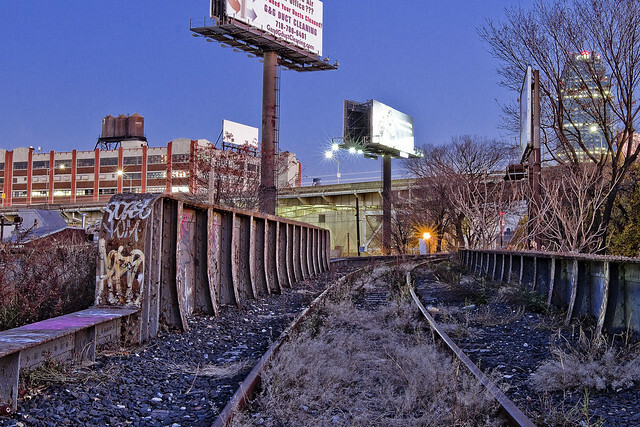 I can speak pretty intelligently about the maritime/locomotive complex around Newtown Creek, but I’ll admit to having vast gaps on the particular subject of the iron road. That was my pal Bernie Ente’s area of expertise. For a historic series of shots, maps, and technical descriptions of anything involving the LIRR, you are going to have to visit the fairly excellent trainsarefun.com. Here’s their Montauk Cutoff Page. Another set of maps and historic shots can be accessed at an equally fantastic site called arrts-arrchives.com. Here’s their Montauk Cutoff page. I’ve written about the Smiling Hogshead Ranch before, which sits on the interchange between the Degnon Terminal Railway and the Montauk Cutoff, over at my old Brownstoner Queens column. The view from up on the Montauk Cutoff is unique. That big parking lot at the bottom of the shot above is a UPS shipping center, the one on 49th avenue. 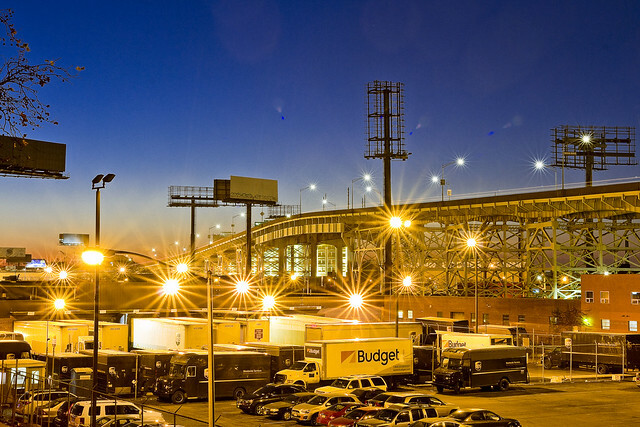 Rearing above and behind it is the Queens Midtown Expressway section of the Long Island Expressway, which arches up and over Dutch Kills some 106 feet from its beginning at the Queens Midtown Tunnel – which is around a half mile away. My MTA companion and I met up at the Smiling Hogshead Ranch at 5:30 in the morning to get these shots, which gave me a solid hour to work in absolute pitch darkness up on the tracks. The shots in today’s post are obviously tripod shots, and long exposures. Leaving the shutter open for 20-30 seconds at a pop, you can gather a tremendous amount of light and color, but the hot spots of electric street lighting always cause certain problems. Compensation for this is to move the aperture into “hyperfocal” range, f11 and narrower, which is counterintuitive for night shots but nevertheless effective. It also produces those neat little star bursts around the lights. 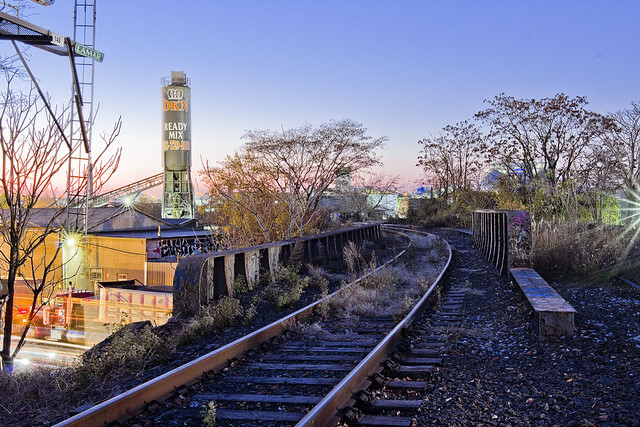 So, why was I out on a chilly November morning with an MTA property manger, walking on a century old rail spur in Long Island City? The MTA has decided to “abandon” this line. Abandon doesn’t mean the same thing in “railroad” as in does in english. It means that the agency has no current plans for the line and wishes to free itself of the duties necessitated in maintaining it as functional track. It means that the MTA will retain ownership of the Montauk Cutoff, and can at any time reactivate the pathway should “future use” require it. Given the speed with which rail projects generally move, however, that means a window of at least a couple of decades of inactivity awaits the property no matter what happens. Accordingly, MTA has issued a “Request for Expressions of Interest,” or RFEI, regarding the Montauk Cutoff and is seeking potential lessees for the space. As defined in the RFEI document, the MTA is seeking out creative uses of the land with an eye towards community improvement. The agency has set down a few ground rules for any potential lessee of the site, many of which are quite expensive – such as insurance, utility service – those sorts of things. The property, as defined in the RFEI, includes the Smiling Hogshead Ranch – who currently lease and pay insurance on the parcel in which the community garden is operated. Before certain web masters start pointing their fingers and shouting “j’accuse” at me while spinning a conspiratorial tale, Smiling Hogshead is indeed associated with Newtown Creek Alliance, as am I. You can absolutely bet that I’m a fan of SHHR’s operations and programming, and friends with a lot of their members. Long Island City needs every bit of green space it can get, which is how I finally get around to explaining why me and the MTA guy were here on the day before Thanksgiving and just before sunrise. A “Request for an Expression of Interest”? You can say that I’m interested. I’m interested in seeing this trackway converted over to green space, in much the same way that the Degnon Spur on Pearson and Skillman – a weedy dumping ground and homeless camp – was turned into a lush garden by a group of dedicated volunteers. Can you imagine what a group like Smiling Hogshead’s could do up here? If you want to get in on the conversation, or contribute some time and knowledge to the project – shape the future, as it were – whatcha doing on the 2nd of December? A bunch of us are going to attend a “visioning meeting” at Nomad Cycle (47-10 Austell Pl, Queens, NY 11101) which is set to happen between 6:30 and 8:30 p.m.
My companion and I had discussed the possibility of getting up here in the pre dawn hours, and a couple of previous appointments had to be cancelled on account of weather. We had met on a walk through of the site which MTA had conducted back in October for parties interested in acquiring the land, an excursion which occurred just before solar noon – which is not the most efficacious time to photograph LIC. I made the case to him that a “proper” set of photos would be needed for this project and quite handy to boot, which my new friend at the agency agreed with. Hence, where we were, when we were, and why we met up in the dark on Skillman Avenue on the day before Thanksgiving. The wrinkle in this potential project is this – it doesn’t necessarily have to become a green space. Anyone can “express interest” in the Montauk Cutoff, and as long as their proposed project meets the requirements set aside by the MTA, it will be considered a viable option. 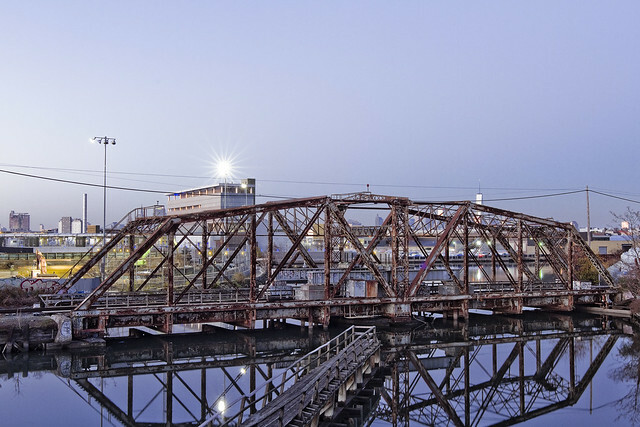 The Montauk Cutoff begins at Sunnyside Yard, and at its southeastern edge connects to the M Cabin truss bridge over Dutch Kills which connects to the Blissville Yard, which in turn feeds the tracks that travel under the Greenpoint and Kosciuszko Bridges to Maspeth, Ridgwood, and all points east. The RFEI states that the M Cabin bridge will be opened, and secured in that position, and that a barrier of some sort will be erected at the edge of the Montauk Cutoff’s lot. Additionally, I cannot begin to, nor have I ever believed that this is the original bridge on this site. I’ve got some Intel that suggests the early 1940’s for its origins, but nothing solid enough to to stick a pin into. The original early 20th century bridge is long gone at any rate. I can tell you with some certainty that the nearby DB Cabin rail bridge is from 1919, and is a swing bridge that hasn’t opened since 2002. My pal Bernie, mentioned above as having been THE authoritative source on all things rail around LIC, told me once or twice that two industrial wreckers are required to tow it from either side to open the bridge. The swing bridges motors are non functional, something that has caused no small amount of grief for the EPA’s Superfund investigators. DB Cabin allows access from the Wheelspur Yard to the Blissville Yard and the Montauk Line. 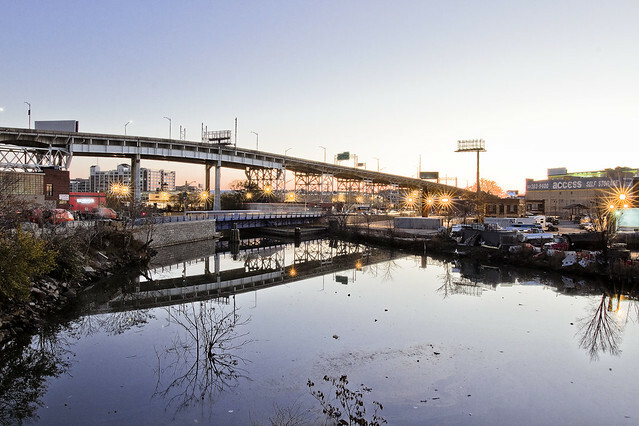 Like I said, Newtown Creek. Looking northwards along Dutch Kills, at a scene familiar and loved by long time readers of this – your Newtown Pentacle. 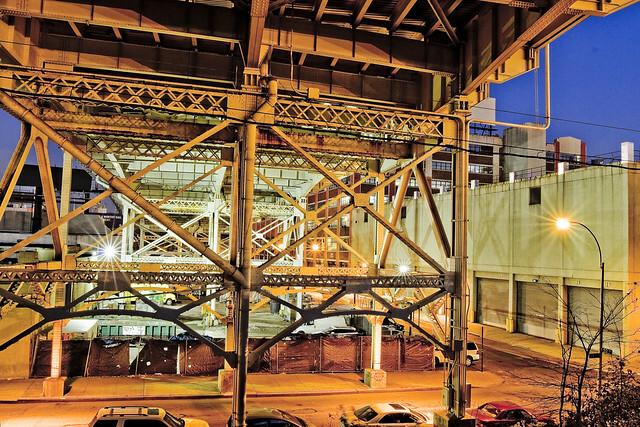 That’s the Borden Avenue Bridge, with the LIE above, spanning Dutch Kills. I’ve been writing about this neighborhood for years, it’s one of my favorite locations in New York City. The Montauk Cutoff leads directly to this spot, which in my mind directly connects it to the environmental problems of the Newtown Creek watershed. Know how I’ve been rattling on for years about “combined sewer outfalls” and the problems presented to the ancient sewer system during rain events? Montauk Cutoff represents an opportunity to create a nearly four acre long green sponge that can drink up a significant amount of the storm water that carries garbage, grease, and poop into this water. Want to get involved in the future of the Montauk Cutoff? As mentioned above, a “visioning meeting” which be taking place at LIC’s Nomad Cycle (47-10 Austell Pl, Queens, NY 11101) on December 2nd, between 6:30 and 8:30 p.m.
Is that orange patina on the rails or just the reflection of the rising sun on metal? I believe it is mostly rust. Please let us know what comes of the meeting. This is so exciting! I hope the park idea works out! Could you possibly post a map outlining the area in question? Hi Mitch, I just wanted to let you know how much *The Pentacle* lightens up my day. I grew up in the Pentacle, but I’ve been living in Frisco for 32 years. I recently was injured pretty badly, and so I’m home bound and (mostly) stuck in bed, recuperating. *The Pentacle *is the hi lite of my day. How sad is that, LOL? Keep up the good work. Mitch, these photographs are absolutely f*cking beautiful! You are obviously a light wizard.